I met up with Emily and Phil in downtown Charleston right before sunset for their gorgeous Fall Engagement session. 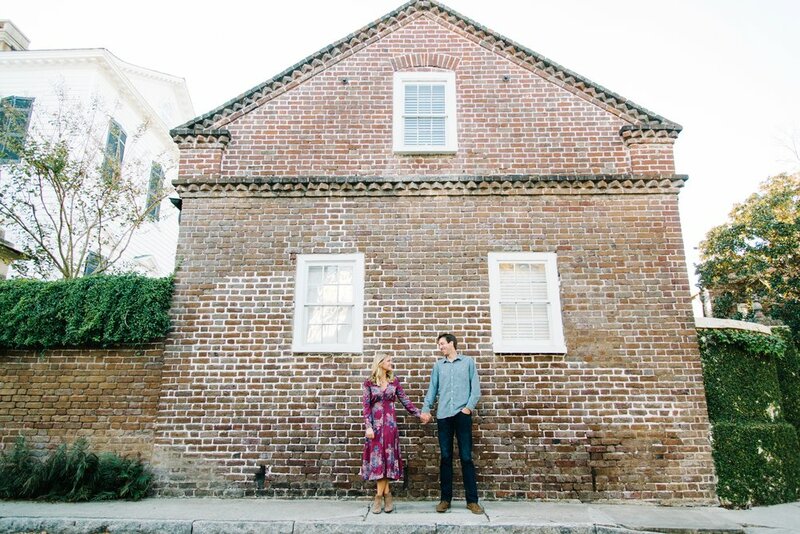 We started at White Point Gardens and then I brought them around to some of my favorite downtown Charleston spots, that I really feel like show off our city in the most beautiful way. These guys right here are proof that deep, genuine, good love still exists in this world! These guys just lit up around each other and you can see that tangible love that they have for each other. You can tell by the way they look at each other that they are totally all in and head over heels. I couldn't stop laughing and smiling when I was with them. We had so much fun together, exploring downtown, getting to know each other, and having an all around blast taking photos! They were a huge reminder to me of why I genuinely love my job so much. These guys made my job so easy and I am literally counting the days until I travel to Grand Haven, Michigan for their wedding day! I can't wait to see these guys say their "I do's" and make this thing official :) Congratulations Emily and Phil! Thank you so much for trusting me, being real in front of my camera and letting that love shine bright!